I found your site of interest - I live on Matteson Avenue in West Warwick, which borders on Coventry, Rhode Island. My great-grandfather, Walter Hoxsie built our home on a small farm in 1910; his son Walter bequeathed the land around the pond to the state to be set aside as green acres. 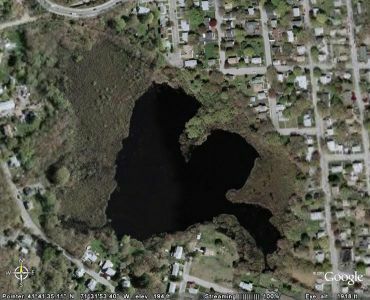 Here is a shot of Matteson Pond from Google Earth - my husband and I like that it is heart-shaped.